They contain flour, fat, sugar and often an egg, which differentiates them from biscuits – they are also chewier or softer than biscuits, which of course as we all know, are traditionally very hard flat and crisp joyless things created by the British as some sort of punishment for unknown sins. The name biscuit means ‘twice cooked’ and Americans have immeasurably improved them by the addition of loads more sugar and eggs and reducing the effort involved by just cooking them once. This is why British people don’t like Americans. Because they are jealous. Fact. Chocolate chip, raspberry and pecan, and very berry granola cookies. Definition: cookies made by other people for you to eat. My favourite sort of cookies. Follow the instructions at www.google.com/intl/en/privacypolicy.html. Mainly these videos are of cookies. We like cookies.They make us very content. Their cookies aren’t as good as our cookies though. The cookie general controls the dissemination of the tiny cookie soldiers. 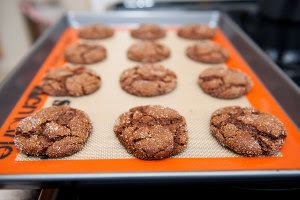 Ginger, pecan and lime cookies are a type of very specific cookie.